PLEASE PUT THE HEBREW NAME USING THE NUMBERS LEFT TO RIGHT AS IT WILL BE ON THE STOOL, WE DO NOT REVERSE THE LETTERS. Help your little one reach for a bit of independence and learn to spell his or her name too. Each letter is brightly colored with non-toxic paint and has smooth easy to fit edges. Made in the USA. Available in primary, jewel, or pastel colors, measures 7 3/4" x 16 to 18" x 8" to fit most names up to 12 letters. Also available in white. Included is a complimentary gift card. Simply specify during checkout what you would like the card to say. We can also send the message to the recipient via email to let them know that you have ordered a lovely stool for them. To make your stool a keepsake to treasure for years, have that special message engraved on the bottom of the stool for an additional $9.95. Please limit your message up to 6 lines and no more than 30 letters per line. The lettering size may vary according to the length of the message. To see a sample click on the larger image. Free shipping offer does NOT include step stools. Gift wrap not available for this item. These are custom made products so please allow 2 to 3 weeks to ship. The white stools generally take 3 weeks to ship. Please use our complimentary gift message so they will know that you have ordered a lovely gift for them. Help your little one reach for a bit of independence and learn to spell his or her name too. Each letter is brightly colored with non-toxic paint and has smooth easy to fit edges. 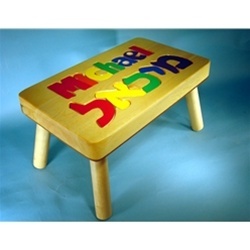 Made in the USA crafted with furniture grade birch veneer and non-toxic paint .Natural Hebrew Stool up to 9 Hebrew Characters Maximum How to translate an English name to Hebrew: Visit http://www.my-hebrew-name.com. Please confirm the spelling of the Hebrew name prior to placing the order as one name can have multiple Hebrew spellings. Since each stool is custom made, we will only replace a stool if a spelling error is made by us. 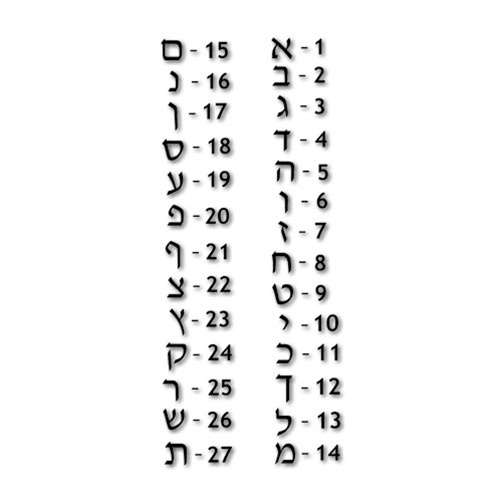 Please use the Hebrew character chart to choose the corresponding number to represent the Hebrew letter. The Hebrew characters will be on the stool from LEFT to RIGHT so please enter the numbers accordingly. When ordering enter the corresponding number for the character separated by a comma in the personalization space. For example, the stool pictured is 13,1,11,10,14.To make your stool a keepsake to treasure for years, have that special message engraved on the bottom of the stool for an additional $9.95. Please limit your message up to 6 lines and no more than 30 letters per line. The lettering size may vary according to the length of the message. To see a sample click on the larger image. This custom made item takes approx 3 weeks to complete. Is lovely. Just really don’t like the color choice. Thank you so much for making three beautiful stools for us. They came out perfectly and so far have been a big hit. I would recommend your company to anyone looking to buy a stool. They are great gifts! Shipment arrived on time. The product was very good quality. Customer service responded promptly to my emails. I recommend this site. Love this item! So cute! And they were able to accommodate my request! So so happy!!! Placed order for english/hebrew puzzle stool on 8/15/13-expected delivery 4-6 weeks and received 9/6/13. Workmanship excellent and colors lovely, heavy grade and definitely worth the price. Would order from this company again!